Twilight, the time between a sunrise or sunset and darkness, can bring magical light to a landscape, especially on clear days when this light is not filtered through clouds. For this reason, we always (despite my strong protests in the morning) are ready for photography at least thirty to forty minutes before sunrise or sunset so we have the opportunity to capture this soft light on the landscape (adjust these times depending on your latitude and plan to be ready around civil twilight for your location, a time that is included on many sunrise/sunset time apps and websites). Death Valley Dunes. Canon 5D Mark II, 17-40 mm lens @ 17mm, f/16, ISO 100. As I have mentioned before, I have a firm "no clouds or good clouds" rule for my photography, by which I mean I would much rather have a clear day than a sky with uninteresting or ugly clouds. For some scenes, a cloudless sky can complement a scene better than a cloud-filled sky might. Take the photo of a small playa among a dune field in Death Valley National Park above. The pinks and blues of twilight add a simplicity that, from my perspective, complements the simplicity and clean lines of the rest of the photograph well. For this scene, the clear sky with the soft gradient and the counter-point of the moon fit my goals for the mood and feel of this image. I feel the same way about the image at the top of this post. Without a dramatic sky, there is less visual competition for the wildflowers and soft light on the peaks. In photographing this early or late light, there are four phases that I enjoy when the sun is rising (sunrise) or setting (sunset) behind me. In addition to the sample photos below, you can also click here to see five unprocessed RAW files demonstrating the progression of a sunrise over the same scene. For the discussion below, I will use sunrise to illustrate the timing but you can just reverse this information and apply it to sunset. Also, I am describing these lighting conditions as I experience them as a photographer, not in terms of their scientific origins. If you have helpful technical details to add about these phases, you are welcome to discuss them in the comments. Blues of Twilight – As soon as the last stars start disappearing is when I often start photographing. At this time, you can create photographs with strong blue tones, especially of landscapes with highly reflective surfaces like sand dunes, playas, or snow. While some of this blue tone may not be natural to what your eye sees, blue tones can be emphasized to help convey the transition between night and day, the sense of cold, or an eerie atmosphere in a final photograph. This light can also complement autumn scenes well, as I sometimes prefer a twilight blue sky over colorful clouds for scenes featuring the reds, yellows, and golds of fall. 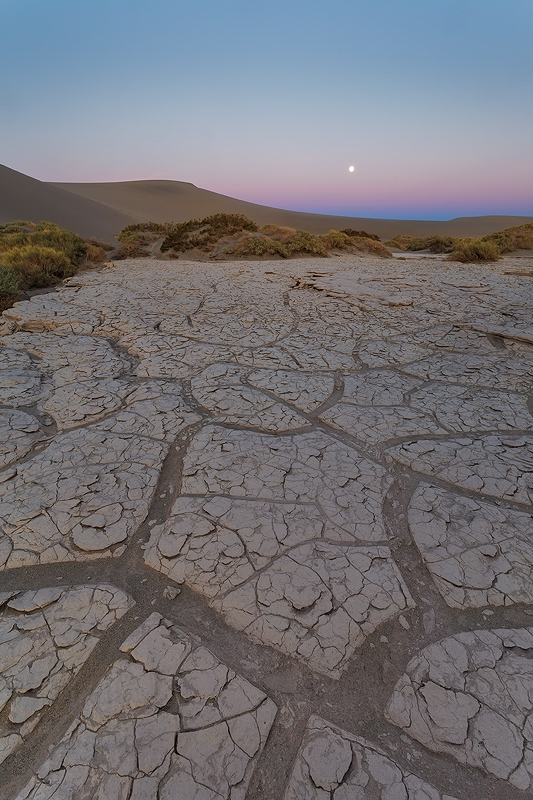 Soft Glow – After the twilight blues fade, a landscape will often take on a soft glow as sunrise nears. This glow is especially perceptible when photographing desert landscapes that include sandstone on perfectly clear days. Other photographers have coined this "salmon glow," which is an apt term because of the tone of this special glow on some landscapes. Beyond sandstone, this lighting condition can complement almost any landscape well because of the pleasant, even tones that appear at this time of day. This type of light is a bonus for photographers who arrive at a spot early for sunrise or stay late as it often happens 15 to 25 minutes before/after sunrise/sunset in the southwestern US (specific timing depends on the location and time of year). Wilson Peak in Winter, Colorado. Canon 5D Mark II, 70-200mm lens @ 98mm, f/14, 4.0 sec, ISO 100. Earth Shadow & the Belt of Venus – As the soft glow fades on the landscape, bands of blue and pink will appear in the sky (how much you can see these bands will depend upon the features of the landscape you are photographing). This is one of my favorite times to photograph in general because these soft pastels add a quiet mood to a photograph and sometimes reflect off the landscape, adding interest to a scene. Also, this phenomenon can help fill a large expanse of cloudless sky with colors that can offer enough interest to make a compelling photograph even for photographers who are cloudaholics. First Light – As the pinks and blues start to fade from the sky, the first direct light of the day will start appearing on the tallest features of the landscape as alpenglow, a deep red band of light that fades to the more golden tones as the sun gets higher in the sky. As this light starts appearing on the subject you are photographing, the sky behind can start to look grey and muddled. Since some of the prettiest light of the morning has already passed at this point, photographers arriving at s spot near sunrise may have missed their best opportunity for creating a strong photograph. So, next time you see cloudless skies and consider not getting out of bed or packing up early, give the conditions another chance, especially if you do not typically arrive very early for sunrise or stay late after sunset. You might find that the atmospheric conditions described above to be a perfect complement to the scene you hoped to photograph. Again, give clear skies a chance!